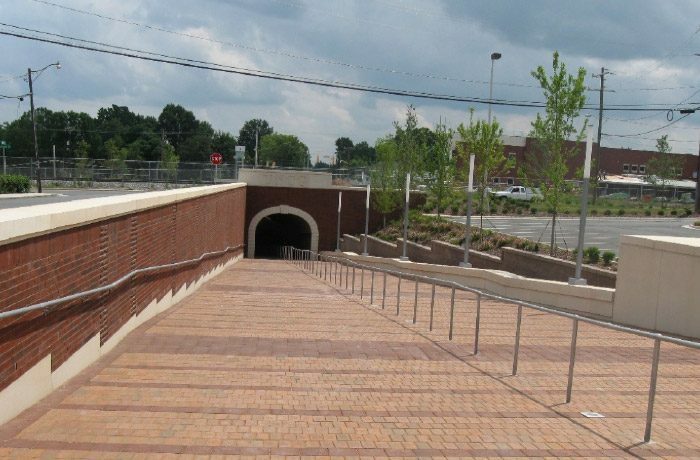 A pedestrian tunnel under a Norfolk Southern rail line, this structure was a joint project between UNCG and NCRR. Designed to provide a safer path for pedestrians and bicyclists as well as creating connectivity between the University’s main campus and their new, expanding campus. The challenge on this $9M project was the open cut tunnel constructed under two active Norfolk Southern main lines and one siding track without disruption in service. Temporary railroad bridges were designed by TGS during construction.